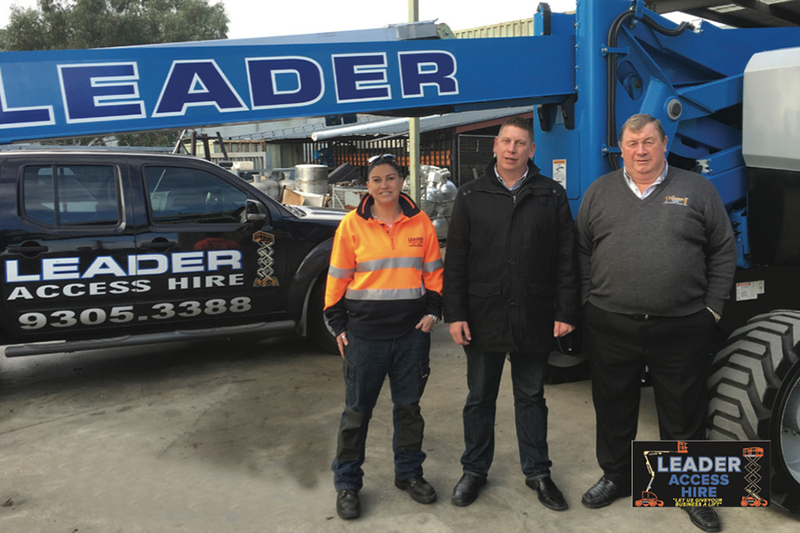 In a first for the Melbourne EWP industry, Leader Access Hire, based in the Victorian capital’s northern suburbs, has taken ownership of the evolutionary Genie Z-62/40 articulating boom lift. The Genie Z-62/40 boom lift has a working height of 20.87 m (67 ft 11 in), up from 20.39 m (66 ft 4 in) on its predecessor, the Genie Z-60/34. It provides more horizontal outreach with a maximum of 12.47 m (40 ft 11 in) compared to 11.05 m (36 ft 3 in) previously. In addition, the platform can be lowered to 2.26 m (7 ft 5 in) below ground level. This boom lift also delivers excellent up-and-over clearance of 8.13 m (26 ft 8 in), and has a 1.52 m (5 ft) jib with increased vertical rotation of 135 degrees. “This is the first Genie we’ve purchased in this class, and we like the fact that it has two additional feet compared to its competitor’s products,” said Rod Shephard, Manager, Leader Access Hire, which counts a number of Genie machines among its EWP fleet. Genie consistently presents reliable machines, according to Shephard, and this advantage was also at the core of Leader Access Hire’s switch to the Genie Z-62/40 boom lift. The Genie Z-62/40 boom lift builds on the strengths of its forerunner, the Genie Z-60/34 boom lift, yet the updated boom offers additional features and key product specifications, according to David Greene, Genie Regional Sales Manager Victoria & Tasmania, Terex AWP. “It’s a compact and hardworking unit, offering outstanding vertical and horizontal reach, manoeuvrability, working envelope and servicing. In all of these areas, the new Genie Z-62/40 boom lift provides significant enhancements over the model it replaced,” said Greene. The Genie Z-62/40 boom lift has a larger working envelope than its precursor. “This will help reduce rental companies’ inventory costs, because previously they would have needed to buy a significantly larger and more expensive machine to achieve the extended reach and capabilities of this new model,” Greene added. The Genie Z-62/40 boom lift is also extremely compact and highly manoeuvrable. Weighing just 9,934 kg (21,900 lb), the Genie Z-62/40 boom lift has zero tail swing and minimal front turntable tail swing, and stows to the compact size of 7.58 m (24 ft and 10.5 in) with the jib tucked. It’s inside turning radius is a tight 2.36 m – down from 3.04 m on the previous model and the unit has outstanding gradeability, being able to climb gradients of up to 45 degrees. Leader Hire, a family run business. From left to right: Peta Shephard, Rod Shephard, Bob Shephard.